An innovative automatic pool cleaning system has been launched by South African company Pro Automation, after attracting interest through its Indiegogo campaign as well as funding from other sources. 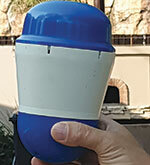 Targeting an estimated South African market of around 900 000 domestic swimming pools, the device, called PoolSense, floats in a pool and regularly samples and transmits the quality of the water and delivers simple dosing instructions to an app on the user’s phone. According to Dave Wibberley, founder and advisor to Pro Automation and a well-known professional in the industrial automation marketplace, Internet of Things (IoT) technologies played a big part in the development of PoolSense. “The Internet of Things, combined with low-power networks like Sigfox, has enabled this development,” he states. The device continuously measures temperature, pH, oxidation reduction potential (ORP) and conductivity, and regularly transmits this data to the cloud. From there the data is continuously run through a self-learning algorithm that effectively understands how a pool responds to the addition of chemicals as requested by the app. Thus the system becomes better and better at making intelligent decisions around optimising just how much acid and chlorine the user needs to add. The company also believes PoolSense will play a part in revitalising local pool shops and maintenance businesses, which can use it to rebuild and reconnect with their customers by offering chemical restocking, calibration and even proactive maintenance services. A maintenance company can install and monitor, and then structure their visits based on the condition of customers’ pools, from their phone or from a PC. Multiple PoolSense devices can be loaded and the view can be sorted automatically by the worst in the list to the closest geographically – adding efficiencies never available to them before. After being in development for two years, fully industrialised and commercialised PoolSense units started shipping in March 2019. 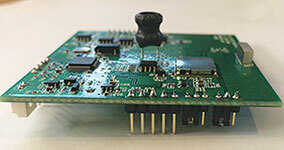 One of the prototype boards used. The device started on a Raspberry Pi communicating to a probe using Modbus. 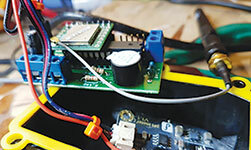 As development continued, the team realised that from a power consumption standpoint, it needed to go for far closer connectivity and have the sensors talk directly to the processor. After choosing Sigfox as its IoT network, the second-generation product was built on a Sigfox development board before being moved onto a custom designed and built prototype in order to better understand the power requirements. The unit needed to last at least two years autonomously in a sealed unit, as the life of the pH probes are only guaranteed for that length of time by the manufacturer. The team consisted of a technical development team, and a commercialisation team responsible for marketing. All team members are part-timers except for the operations manager, Kevin Herbert, who is fulltime employed to ‘pull it all together’. The technical development made up roughly 50% of the resources required; the balance was on the marketing, sales, money management and fundraising efforts required to pre-sell 150 units through the Indiegogo crowdfunding platform. The second phase of the funding was done through the Indiegogo crowdfunding campaign, where the first 100 units were discounted in order to raise money for production. “We raised enough cash through direct sales and the crowdfund to pay for the production of the first 150 units that started shipping in mid-March 2019. A lot of international enquiries were received from Europe, Australia and Asia as all of these areas support the Sigfox network,” Wibberley continues. The product has already won some awards from the Innovation Hub and has made the finals of the 2018 MTN IoT Awards that will take place in September this year.